Anita Jones received her Ph.D. in computer science from Carnegie-Mellon in 1973, when Bill Gates and Steve Jobs were minor blips on the radar. She was a pioneer in a field dominated by men. She co-founded her own technology company, Tartan Laboratories, in the 1980s; and in the 1990s, she directed new technology development at the Department of Defense — another world dominated by men. 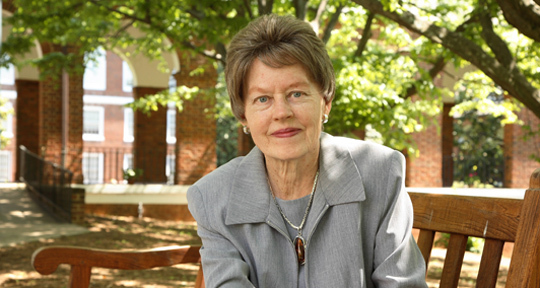 Currently Professor Emerita at the University of Virginia, Jones continues to concentrate on teaching and research in the field of computer science. Jones was recently awarded the Philip Hauge Abelson award at the AAAS Annual Meeting for her contributions to science. AAAS MemberCentral: You recently were awarded the AAAS Philip Hauge Abelson award for your outstanding achievements, contributions, and public service. What does it mean to you to win this award? Anita K. Jones, Professor Emerita at the University of Virginia: It means recognition by my peers. It is both thrilling and humbling when one's peers say in one way or another, "You are doing good work." To be counted among the past recipients for whom I have great respect is a great honor. AAASMC: You received a Ph.D. in computer science in the early 70s, when Bill Gates and Steve Jobs were just on the verge of starting their respective companies. What was it like to be a female pioneer in a male-dominated field at the time? Jones: I have been privileged to be able to be a player in the information technology revolution as a researcher and educator. The change in technology, and even more so, the changes effected in society and how an individual lives their daily lives has been monumental! To be even a little part of that makes for an exciting life! As an engineer, I work in a professional world where "the right answer" to a problem is of paramount importance. While I have encountered some difficulty along the way, almost always men and women were judged based on their ideas and their performance. I never felt like a pioneer, but a person who was in the right place at the right time to genuinely contribute. AAASMC: Most of your career has been spent in teaching and research. However, from 1993 to 1997, you served as the Director of Defense Research and Engineering at the Department of Defense (DoD), where you managed the science and technology program, including the development of new technology. Can you talk a little about the types of projects you worked on there? Jones: The DoD science and technology program delivers new, technology-based capability to the military. Often the DoD investment in a technology spans a decade because it is not sufficient to do the research; the technology has to be reduced to practice and then applied. During my time in DoD, we funded micro-electrical mechanical system (MEMS) technology. Today, MEMS devices are cost-effectively manufactured and found in all manner of civilian and military systems, such as the airbag sensor/actuator. And they provide critical, low-cost capability as components of military systems. Another project was developing unpiloted air vehicles. In the science and technology program (not as a requirement requested by any service) we built the first Predator aircraft for battlefield surveillance. Initially they were embraced by some in the military and rejected by others. Today, they have become a powerful tool, used broadly by the military. Projects are interesting, but the most important investments that DoD makes in the S&T program is in people — established researchers, graduate students, and prototyping teams in industry, government labs and the universities. All invention and technology transfer comes from the minds and the activities of these highly educated and talented people. AAASMC: Your work has taken you all over the globe, to Capitol Hill and to the White House. Is there any particular experience that stands out in your mind as one you never expected to have in your career? Jones: One experience that I treasure most is the opportunity to work with implementation teams and advisory committees composed of some of the most talented, experienced individuals on the planet. It has happened many times — lucky me! In our nation and the world are many accomplished individuals who give their time and energy to solving the problems of society and the nation. It is an honor to sit at the same table with them, but the real pleasure comes from the give-and-take that yields a solution to an important problem. AAASMC: You have been in a field where technology has changed very rapidly over the years. What development has been most surprising to you? Jones: I have two answers. First, in times past, technology was the basis for new infrastructures such as the electrical system and clean water to every home. Those infrastructures are created and managed by industry. The individual need only flip a switch or turn on the faucet — they are barely involved with the infrastructure. With today's revolution due to information technology, the individual can craft the way in which they interact with the underlying information infrastructure of communications and computing so that it is personalized to that individual. Second, my description of the history of computer science to date is that all the advancements have moved the information processing closer and closer to the human brain. That information processing was isolated in some "machine room full of immense computer boxes" in the 1960s. Today, we carry small devices, and walking down the street you see people interacting with those devices to help fashion the next part of their day. AAASMC: What advice would you give to someone going into computer science today? Jones: First, I would reaffirm their choice of discipline. For the duration of their professional career it is clear that computer science will be the basis for huge and unpredictable changes in the world, and that makes for an exciting career. Second, I would suggest that they don't stay in one niche. Seek out new uses of information technology, whether in research or in industrial application. In computer science, you have the ability to "be where the action is."